It may not be a robot behind a bar, but this bot looks like it can mix a precision cocktail in no time. Its creator, Nick Johnson, uses a Motorola Xoom and a custom open-source app as the interface through which you order your drinks. It allows patrons to select the drink of their choosing. It also features an “I’m Feeling Lucky” button, which dispenses 3 random liquids. However being truly random, you might get the same fluid twice, and it will almost surely be disgusting. Two rotating platforms contain all the alcohol and mixers necessary for a host of drinks. When a cup is placed between them, the bot rotates and distributes the appropriate quantities, using a scale to measure the correct amounts. As for dispensing the liquids, Nick pressurizes the beakers with an aquarium pump and uses a pinch valve to control the flow. The pinch valve uses a simple rotating peg that cinches off the tubing used to transport the liquids to the spout. It can stop and start the flow very quickly, and was easy to make, given that he had a laser cutter on hand. The beaker containers are a nice touch; they make it look a lot more scientific, like a chemist was mixing up your drinks. 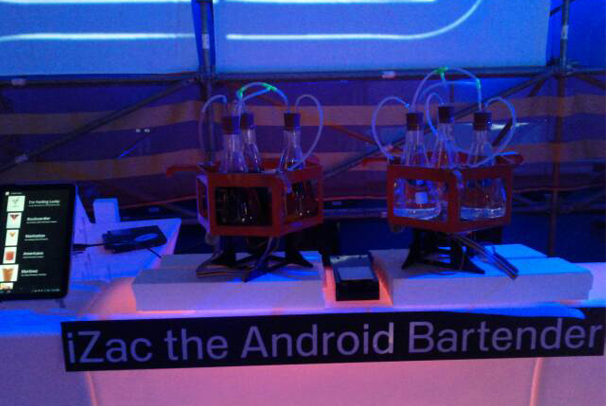 Right now it only holds 3 beakers on each turntable, making it six different liquids at once. However, Nick does list his plans for the future and they include having a wider variety of liquid, among other things. Check out the source link for a more detailed explanation of the process.